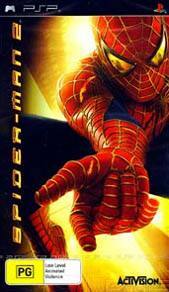 Spider-man 2 is loosely based on the second movie in the franchise and is one of the first generation of games to hit the PSP. Two years have passed since Peter Parker first hit the streets of New York City as the conflicted crime-fighter Spider-Man. Now he finds himself battling his most diabolical villain yet, the mechanized, multi-tentacled Doc Ock. In this edition of Spider-Man 2 for the brand new PSP hand held gaming console, gamers get to play through missions trough the movie and unlock scenes from the Spider-Man 2 movie. The gameplay of Spider-Man 2 for PSP is totally mission based (19 missions) which is a bit different than the PS2 game where it was free flowing through the whole city. 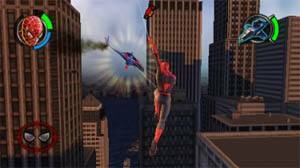 The missions are extremely varied that include web slinging around, saving people from fires and falling cars or just defeating the bad guys. Although you can't freely roam the city, you can freely roam the levels, unlocking some great hidden secrets. 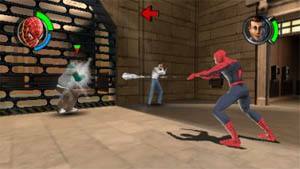 Graphically, Spider-Man 2 for PSP offers up some of the best graphics we've seen to date for this new console system. The game's motion graphics and models are extremely well rendered and you really do get a sense this is a quality game. The levels are also well rendered and make for a visually pleasing experience that will defeat be a winner on this console. The sound effects and the music is relatively straight forward and what you would expect from a movie game. However what is really impressive about the PSP version is that they actually use the actors form the movie to do the character acting which nicely compliments the graphics of this game. In conclusion, Spider-Man 2 for PSP is a fun adventure title that I'm sure gamers of all ages will enjoy. It's a nice, straight forward game that follows an interesting storyline, has brilliant graphics and sound and features some great addictive gameplay. Check it out!